When out in the serenity of the bush I often found myself interested in identifying and learning more about some of the species of birds. I contacted Birding Australia and they recommended the first 3 field reference books below. If anyone is interested 'Field Guide to Australian Birds' (Complete Compact Edition) by Michael Morcombe is a very comprehensive text, by a well respected author, a few bird watchers recommended. The books helped me identify a Red Wattle Bird recently and I am hoping to spot a Malee Fowl and if possible get a pic for the forum, but I need to improve my navigation skills first! A few simple tips on navigation: Follow a creek or a river & you will never get lost, PROVIDING you never cross over the creek to the other side! The reason for this is that if you do cross over, on the return trip you may end up following a fork in the creek which will take you in the wrong direction. Keep stopping to look behind you, seeing the same area from a different view can be confusing. You need to be able to recognise your route back. A compass can keep you on a straight course if you hold it in your hand all the time & pay attention. At night the southern cross can be your guide, & in the morning sunrise in the east. Keeping a straight line without a compass is done by placing your back against a tree & focusing on a land mark or particular tree in the distance in the direction you wish to travel. When you are getting close to that land mark, again you place your back against a tree & focus on another land mark or particular tree beyond the original one. Mark your trail. You can either use surveyor's tape or make a mark with a tomahawk or hatchet. I simply mark the bark without cutting into the tree, but make it large & highly visible, & remember, you need to mark both sides of the tree. Not allowed to do any bloody thing yet except one circuit round the garden plus my three sets of exercises which I usually have done by mid day. Goat got in the garden Tuesday, that was heaps of fun!!!!!!!!!!!!!!!!!!!!!!!!!!!!!!! Get well soon Keith!! If I lived a bit closer I would help you out with the goat. I have been doing some of what you said. In the first area I explored looking for a campsite, I used surveying tape (really an old sheet torn into strips). It worked, but I found I would discover other tracks/areas I wanted to explore & couldn't, as I'd have to leave the marked trail. You're 'don't cross the river' tip I learnt the hard way. In my car. While looking for a camping site once I got creative. I also got lost. Again. While travelling down a dirt track, I saw another area I wanted to explore, but I didn't want to get confused by marking another route to it and off my main route back. So I thought I would just drive a short distance up this track without marking it, then come back & continue if it was no good. 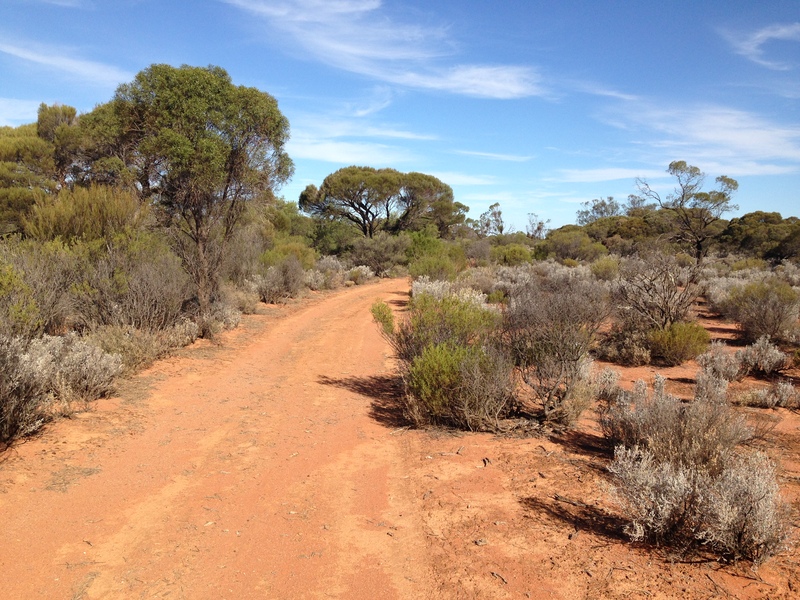 I didn't see an ad-joining track to my right through the scrub, that this new unmarked track I was travelling down! So on the way back instead of following this unmarked track back to where I stopped marking, I went up a deceiving, wrong track! The track I didn't see that ad-joined this unmarked track, back to the main marked track! Once I realised in horror what had happened I took short timed 10min trips in different directions and down different tracks and by trial and error to finally recognisable my marked track, then by chance see one of my markers (thank God I am an thorough man & placed numerous markers!). I was able to find my track again, but it wasn't easy & scared the crap out of me to say the least. As far as landmarks there is a very big hill near this area, which would probably save your life. BUT, the deeper you go into the scrub, the harder it is too see. The hill can disappear for 20-30 mins when driving. Now think about being on foot. I took a compass bearing of where town the main road was, but once in this type of scrub and to be honest with you, at my age and fitness level, I think my chances would be very slim. I am no expert but a 3 hour hike back to town would become multiplied ten times in Malee country. Not trying to sound melodramatic, but these are things to consider. As mentioned, I am currently brushing up on my compass navigation skills, getting a map of the area and possibly buying a GPS. I have since explored this area in depth. It is approx. 5kms square and is bordered by a cattle fence & 2 main roads. So its pretty safe. But if lost people have gone in circles & died only a few kms from civilisation without the aid of a compass. Only problem is many have used the area for dumping & there is evidence of a lot of trail bike use & some soil erosion. I heard one bike once when I was out there. They have created too many tracks & with the dumping, they have to 'some' extent ruined the area. Since talking to a local I have found a new area that is fantastic & I am extremely excited & keen to explore it, once I am fully prepared! This area also has landmarks. The (new) area I am considering camping in is more remote & there are less tracks. I studied it using satellite photographs. And observed it from a road on dusk once. When doing so I saw the biggest Emu I've ever seen in my life! No pics sorry it was too dark & happened too fast. I was also driving. It is an interesting area to say the least, yet it is also quite daunting. Its not bordered by any frequesnted roads or cattle fences, as far as I know- one mistake out here & you're dead type deal. 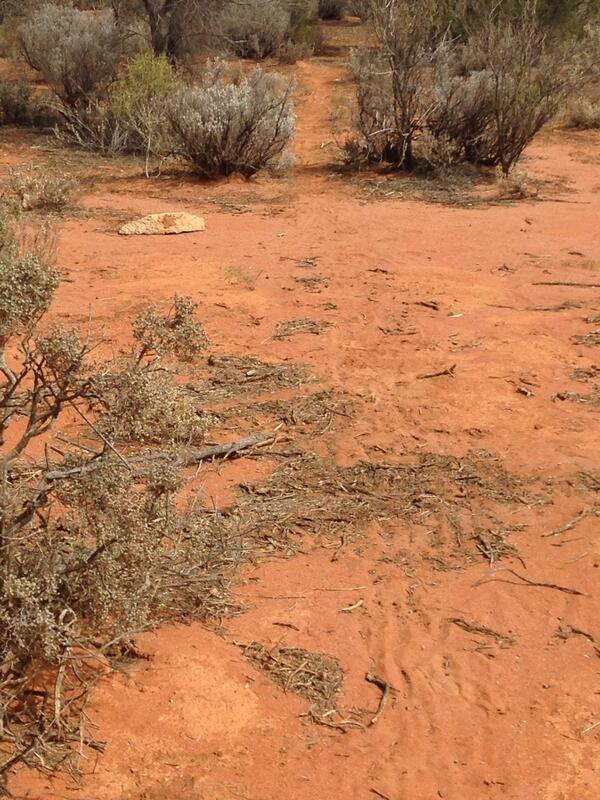 It is arid Malee country & there is no water or creeks from what I can see, only dry washes. That said we have had some rain, so who knows. I will have to hike in with as much water as I can carry (6 litres). I will survey it first using my vehicle (as usual), choose a camping spot, then hike in. The hike should take approx. 2.5 - 3 hrs. Obviously taking precautions, being prepared and will have a number of emergency redundancy plans in place! I have not been in the area for long. When I was in the city it was a nightmare for a man to try to find somewhere he could camp in peace, minus the red tape and endless rules we are all suppose to know when even the authorities don't. Not anymore. A man can live free out here, at least for a few days. I like that. This is the area I am working in. 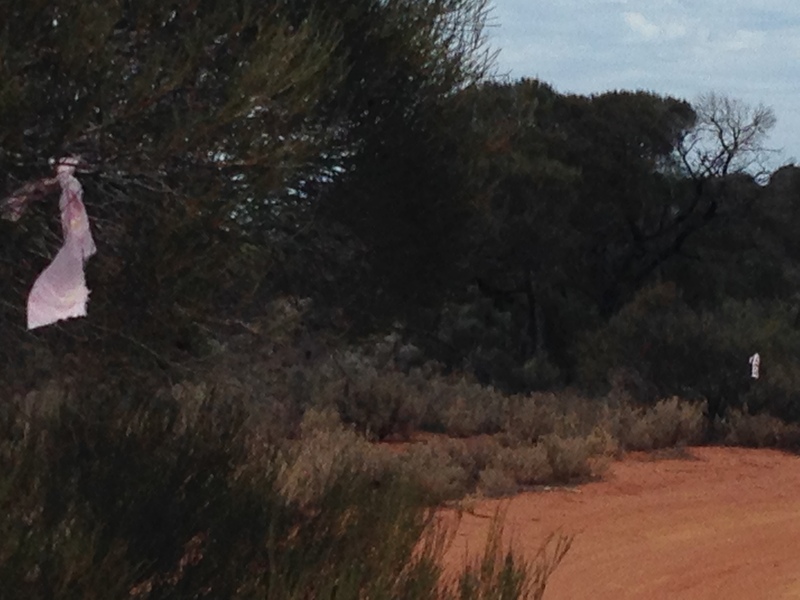 The Australian Outback. My 'back yard', so to speak. I am blessed to be living out here. Some recent pics of my last trip. Beautiful country. At least for now & in my life time... Not the hill I was talking about, but nonetheless a hill. One of the many 'labyrinth' of bush tracks I explored! Some become less & less used as I travelled down them. That became both exciting & scary. Only the brave, capable & prepared dare press on... oh, and those with cell phone coverage Adventure to the max! Track marking. Old sheet purchased from a Vinnies store. Afternoon tea, or should I say coffee using the classic Australian Cecil & Co. Billy #1. Don't worry I don't light any fires during restriction season. 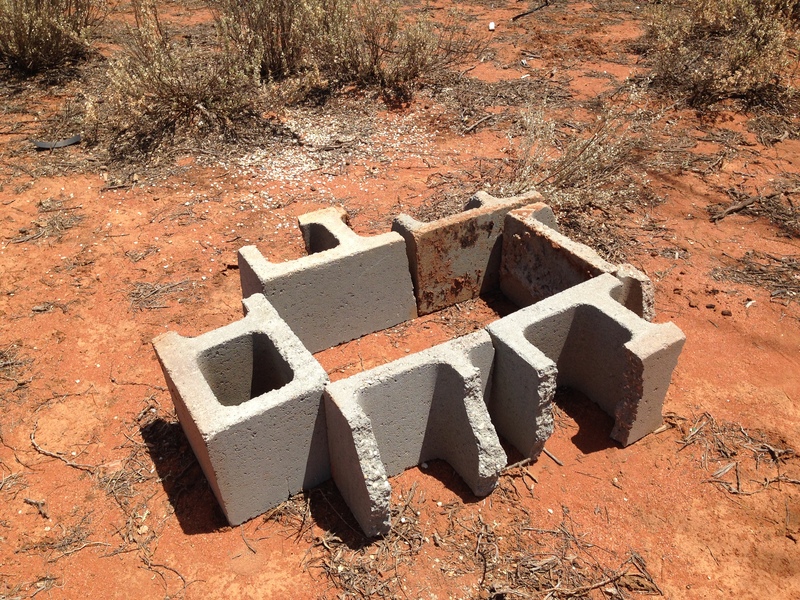 I constructed a fire place using dumped materials for safety's sake & for use in winter for others & myself. I used Australian Army Esbit cubes, but I had a job getting them going as it was an incredibly windy day. Another fire place I put together for others & myself to use out of fire ban season, using materials dumped by people in the area. 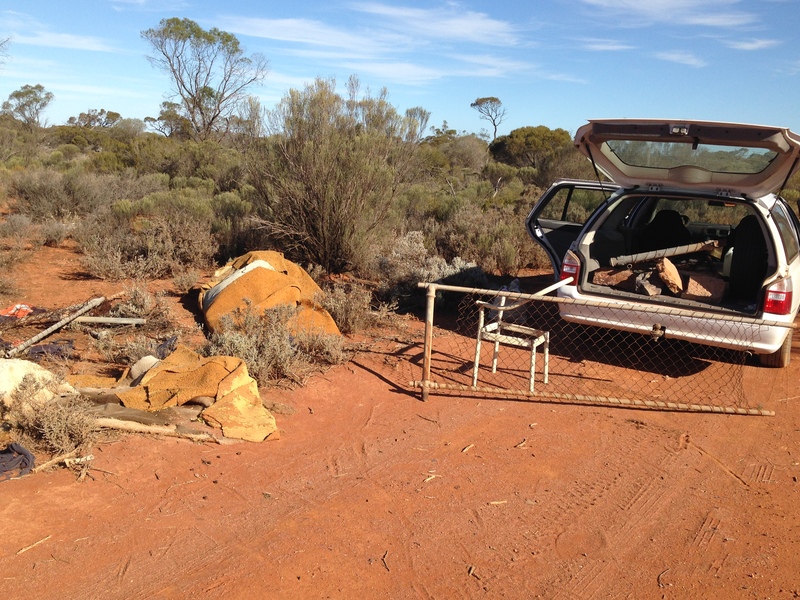 Illegal dumping is rife in the first area I explored. But this was near the road. No dumpers had dared venture as far in as I did. Sobering thought. Here is a track I was marking, I had to clear it because of a dumpers. It took 25mins. Should have taken a before shot, sorry. However, like they say 'one mans trash is another man's treasure' & lessens the impact on the environment at the same time. I needed/ been looking for these 1950's era galvanised fence parts & brackets for repairs & gave up. One cant buy them anymore & they are very difficult to happen upon in salvage stores, especially when they are 1000+ kilometres away from where I live. That's quite open country Edward. If you have a map and it shows some tracks - they usually run in a general direction. As an exercise to become more comfortable, and this is just an example. You can cut through the bush toward a known track at right angles. Take a bearing and go. You're pretty safe really. Start off small, like 1km. Better still, if the sun is out, take a bearing and face that direction - where does the sun hit you? Over your left shoulder? Ahead but to the left? Head off and maintain that position relative to the sun. There is lots of information on a map, especially if it is topographic. Sure is. Makes sense. Its been a while since I 'really' used traditional & primitive nav. skills, as opposed to street directories, ones online & the GPS. Looking forward to re-visiting old skills. I still remember how to find north using a wrist watch though. Morcombe's is an excellent book. Even better is his ebook, available for both Android and iPhone. It's around the same price, $30. For that you get smart searching and sound recordings of bird calls. And free updates! Birds Australia is often reclassifying or renaming birds, and updating the "app" is way cheaper and easier than publishing a new printed edition. Thanks, mate. I heard about that- yes the sounds are a great idea! But I'm content with a book. Old habits die hard as they say. Besides hard copies never run out of batteries in the field & I can lend them to friends & family. Thank you. Getting there, not using a stick anymore. One of the many 'labyrinth' of bush tracks I explored! Some become less & less used as I travelled down them. That became both exciting & scary. Only the brave, capable & prepared dare press on... oh, and those with cell phone coverage:non sono stato io::linguino: Adventure to the max! This is the definition of the middle of nowhere:_risata: As Mack said to Jesse Venturer in the movie Predator, 'lose it here and you're in a world to hurt'. 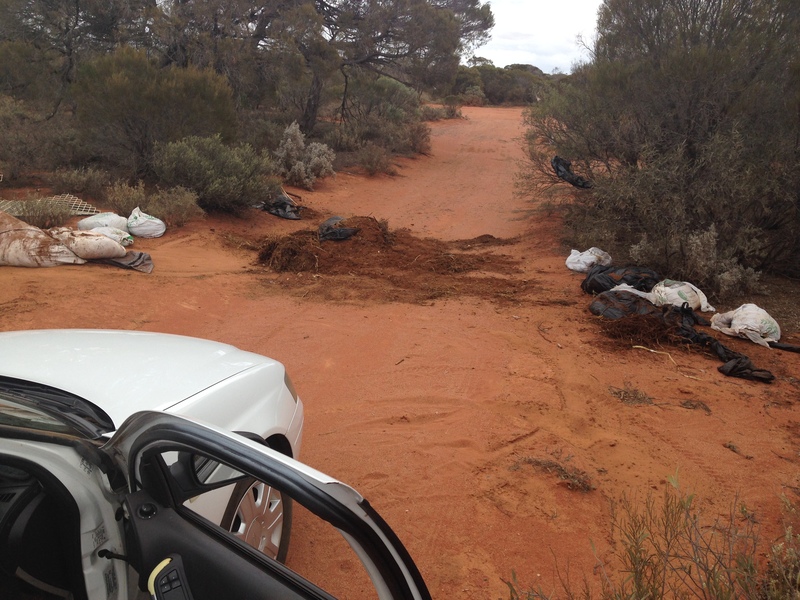 Illegal dumping is rife in the first area I explored. But this was near the road. No dumpers had dared venture as far in as I did:linguino: Here is a track I was marking, I had to clear it because of a dumpers mess:ngazzat: It took 25mins. Should have taken a before shot, sorry. Thanks. Yes a GPS is a very good idea. As far as EPIRB's are concerned there is a new device called PLB (personal locator beacon). Basically the same thing but for land use. There are some real compact versions now. Got back out there again today. 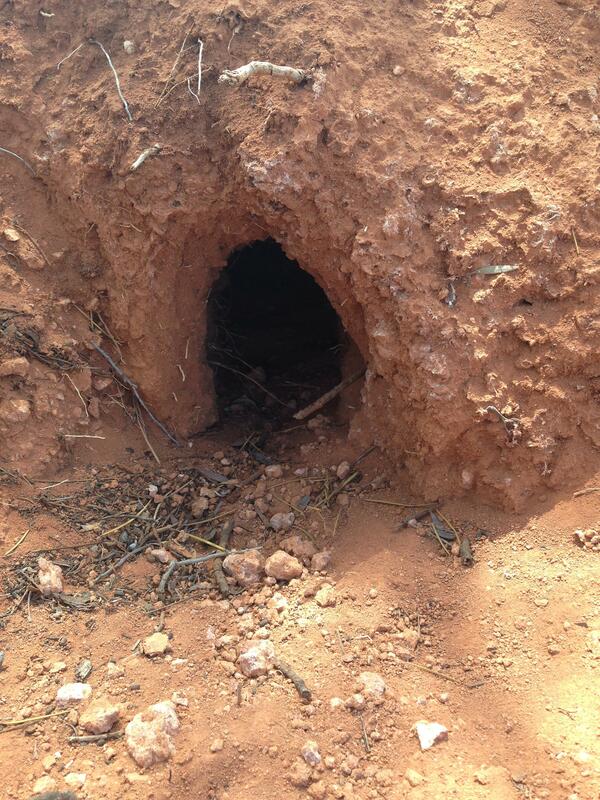 Small burrow approx. 10cm in diameter. Possibly a fox, but hopefully a marsupial? 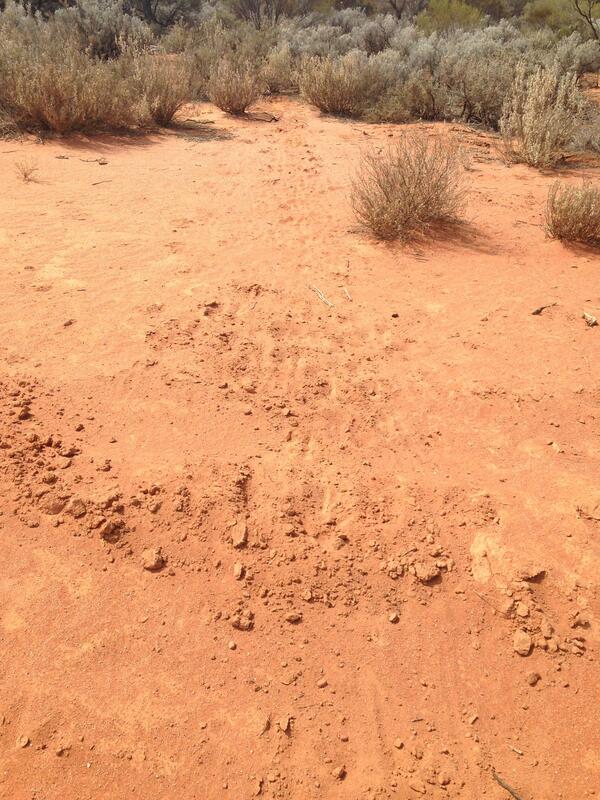 I think these were wallaby or Kangaroo tracks, but I'm not sure. Tail marks & faeces in the area suggest it. They headed off right into the bush. 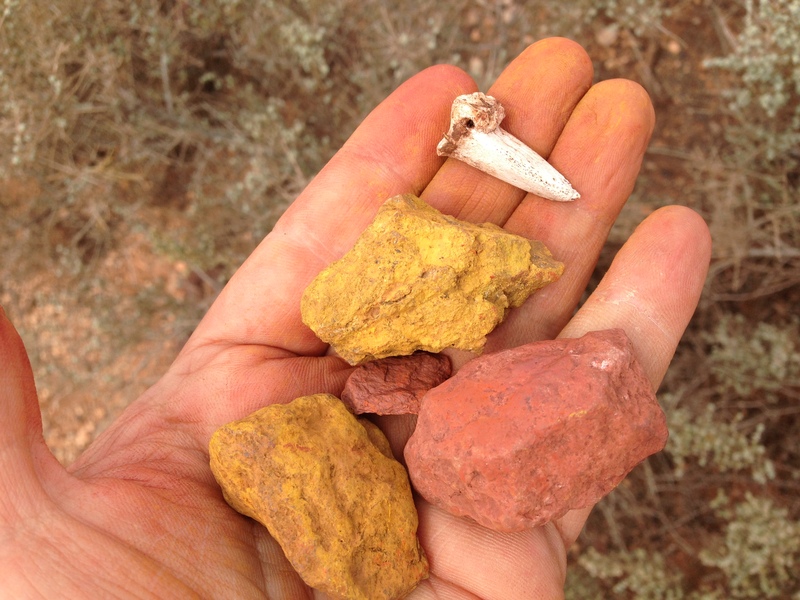 Red & yellow ochre and what appears to be a large dingos tooth. Look how easily the ochre came off on my hands. Edward, I haven't seen an Ikea hobo stove used like that. How do you feed the fire? I did mine like this. Thanks. Great pics, I don’t think that is a tooth as it seems to be made of bone rather than enamel. Think it is probably tip of a tail and that might be the den. Great set up you have there! I understand. It is new. I haven't modified it yet. 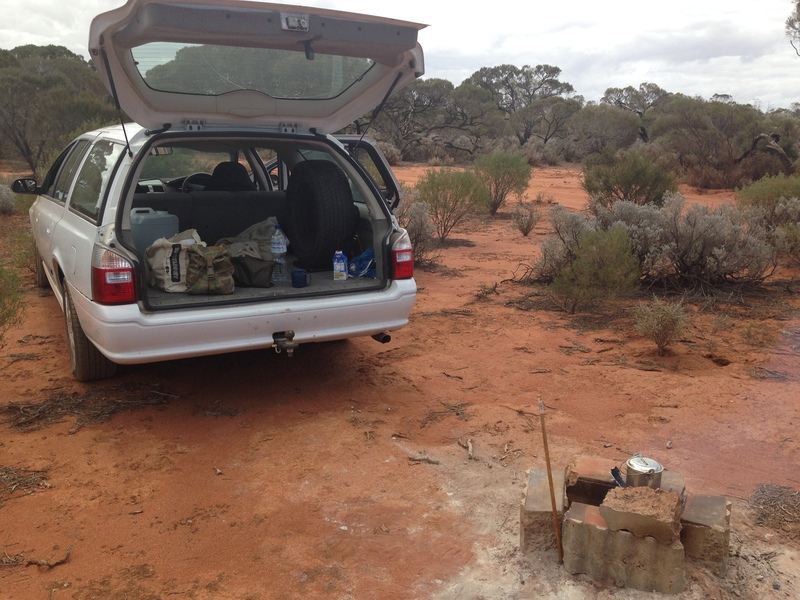 I fed it by using gloves & lifting it up (I only used fuel tabs for now, until fire ban season ends). I do plan to cut a hole in it like yours to feed/ use a wood fire. However, I am planning to use it the other way around (upside down). I took the idea from the pathfinder stainless steel canteen cup stove stand, & military issue USGI aluminium cup stove stands. I noticed the grill of the hobo stove is actually the same as the Pathfinder canteen stove stand (it has 4 little feet that slightly lift the pot off the grill for better heat flow. I also noticed the USGI stove stand has no base. I always wondered why. Then I had a theory why! 2.) Why add more weight using tent pegs, when I can just flip the thing around. 3.) Also my guess is if its off the ground, the fuel will burn too fast. I like to cook casseroles, stock pots & goulsah & they require low heat to simmer. 4.) I'll have have to feed it too often (see below why). 5.) 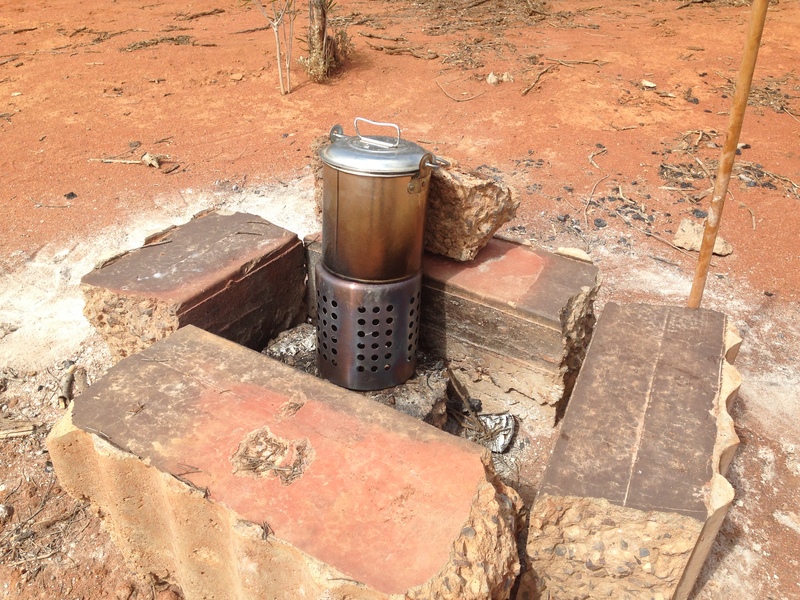 Have you ever studied a USGI alloy canteen cup stove stand? They do not have a bottom on them. This is actually quite handy- what I have found when out camping is I often have a fire going, especially in winter, or after cooking a meal I want coffee. That means there are coals there, right. So I can just keep moving the hobo stand (like the USGI stand) to fresher coals, without the need to keep re-light & restocking the fire with wood & getting too bigger a flame- effectively just placing it over fresh coals! Of course if I want to just boil water fast I can stoke it with wood. Its a theory I am going to try after using a rotisserie spit for years & cooking stockpots, especially where slow cooking is required. What do you think of this 'theory'? Do you think if one followed an animal track the chances of finding water would be increased? I did that successfully once. But it was obvious. 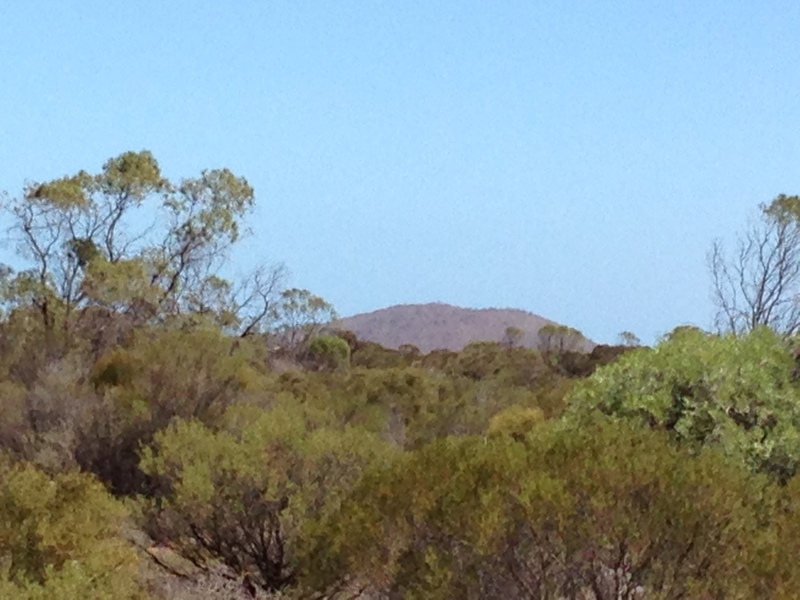 I was in the north flinders ranges - I think it was pre heysen trail days. I was following an animal pad along the top of the range, for ease of walking, and I noticed more and more tracks converging into my track - that's when I knew. I followed it into tall grass or reeds, I forget which. I could tell that it was underwater at some point. It went deeper and deeper into these reeds then stopped at a little hole that had been dug down - there was mud at the bottom. It was a soak. I think as the animals came, they'd hook some of the mud out, and wait for the bottom to fill with water. I used a hanky Finches are a better bet in dry country - they are never too far from water and return to it fairly often. One animal track - no. Look for a convergence of tracks. If the tracks are leaving the track you are following, then you're going the wrong way. The track you want should get bigger and more defined the further you go along it. I did that successfully once. But it was obvious. I was in the north flinders ranges - I think it was pre heysen trail days. I was following an animal pad along the top of the range, for ease of walking, and I noticed more and more tracks converging into my track - that's when I knew. I followed it into tall grass or reeds, I forget which. I could tell that it was underwater at some point. It went deeper and deeper into these reeds then stopped at a little hole that had been dug down - there was mud at the bottom. It was a soak. I think as the animals came, they'd hook some of the mud out, and wait for the bottom to fill with water. I used a hanky Finches are a better bet in dry country - they are never too far from water and return to it fairly often. I really appreciate this. That makes sense. 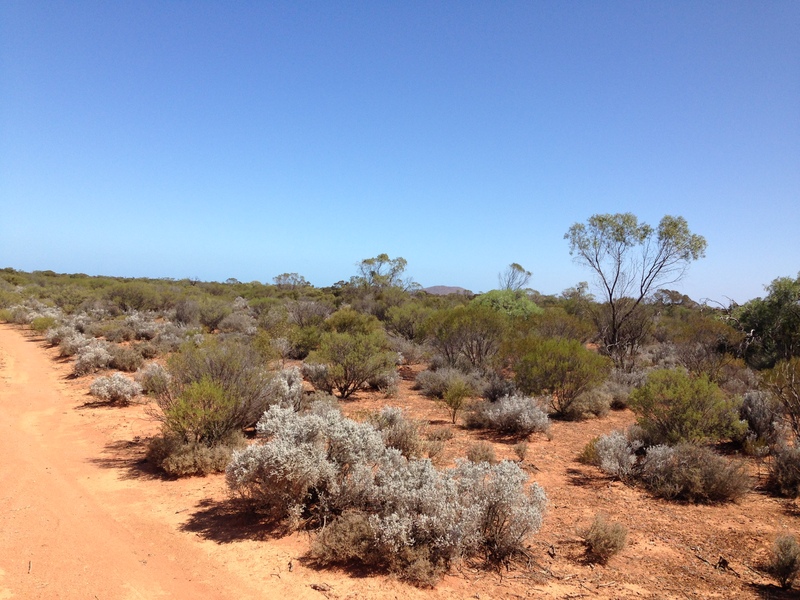 The Flinders Ranges are a very arid area. Like Alice Springs, where I lived for a time, I think animals rely on run offs, soaks (as you said) and water collected in shady rock pools & trees, reducing evaporation times. I would like to explore some of these tracks using a GPS, providing I don't get lost of course! PS: Hey Randall, see those short bushes in the photos of my last trip? Those were the wretched things I was telling you about & why I need gaitors! They look harmless, but are stiff as anything (like mini trees) & are everywhere out here- tear the crap out of you're calf's & shins. Bleeding, & sore for days. When we became acquainted I kicked one once. Instead of it moving I nearly fell over! 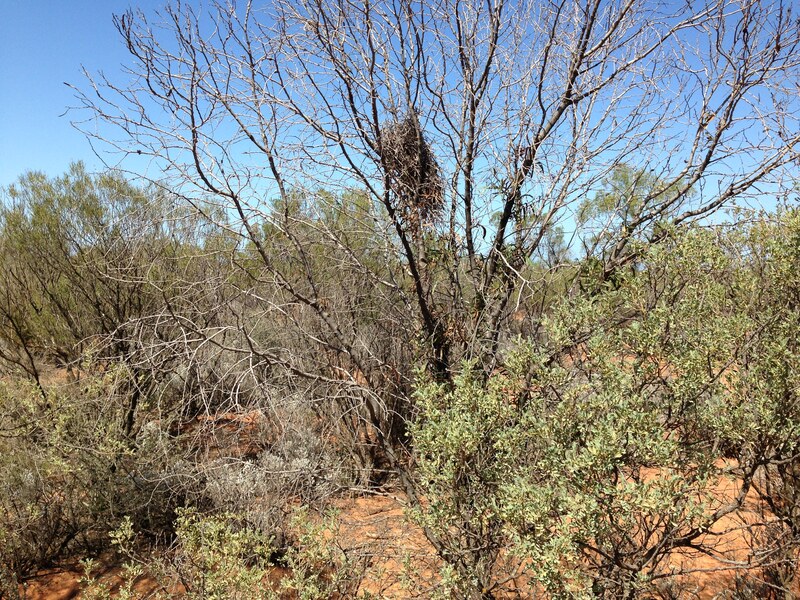 Now I know why they called Australia Gondwanaland Land- prehistoric mini bushes or something! It is the same here in the high country (tasmania). The ground is poor, rocky, and gets horrendous winds off the antarctic or from the west unrestricted by any other land mass. Anything that grows is woody and tough. Mostly horizontal bush. 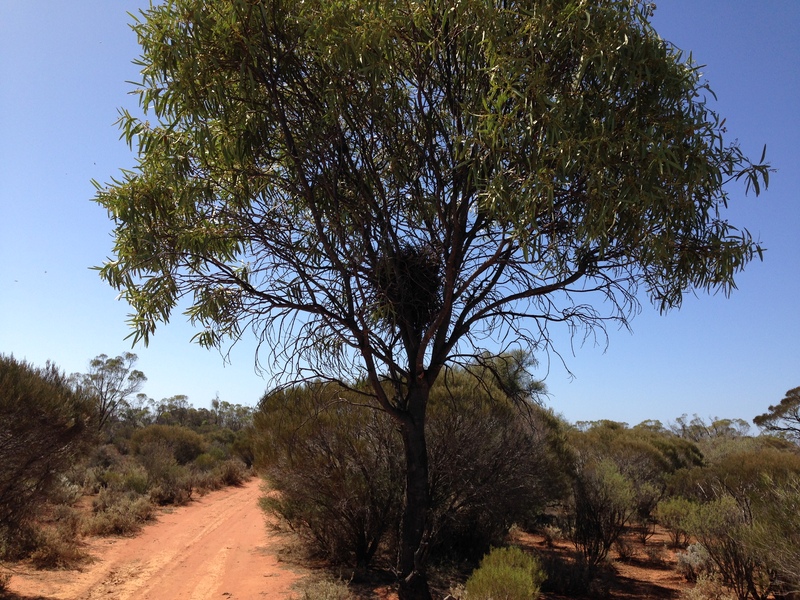 In southern Tassie this stuffs grows prone pointing north because of the prevailing winds. Over toward the West it points to the East. If you're walking into it - ouch. Animal tracks are no help because they're all knee high, under the waist or thigh high canopy. Cuts your legs to shreds. You start off thinking "this isn't too bad", after an hour or two, every touch hurts. That's weird re the wren - I remember seeing some wren, running around on the ground, that was unique to the Northern Kimberly (Mitchell Plateau?). And a drongo. Is your wren something that stays mostly on the ground? That would make it easier to spot / identify.